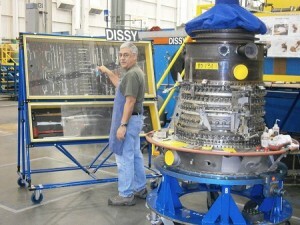 There are hundreds of specialized tools used on a daily basis at the United Airlines jet engine rebuild and test facility, a 20-acre maintenance and operations center adjacent to San Francisco International Airport. United jets are brought to the facility, where more than 1,400 employees work, to have their engines rebuilt. Here a tool used every day might cost several thousand dollars, and test equipment can cost even more. Each mechanic is provided with the specific tools and test equipment needed for the job at hand; when not in use the tools are kept in locked toolboxes located in assigned areas. The shop uses the integrated Morse Watchmans KeyWatcher® key control system to store keys for the toolboxes and to enable complete control of access to individual keys. An audit trail tracks data regarding who removed any key, when it was taken and when it was returned. through their cycles. Each cell includes all the needed parts and point of use tooling. One side of the cell is dedicated to tear down and the other to build and all tools are kept separate. 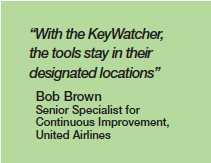 Prior to implementing a KeyWatcher key control system and new procedures, Mr. Brown remembers that tool usage was not well organized and tracking tools was difficult. Non-tool items were often placed into tool boxes and the potential for foreign object debris (FOD) being sucked into an engine and/or damaging a blade was ever present. With the new policies and procedures, those issues have been minimized and/or eliminated. “In the two years since the KeyWatcher system was installed, there was only one missing tool, which was found after two hours. That’s a pretty good record so far for a facility this size,” adds Mr. Brown. 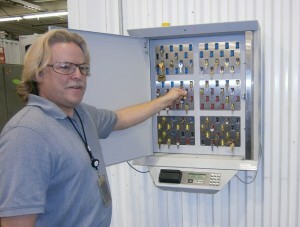 The facility uses one 96-key and three 48-key KeyWatcher cabinets. 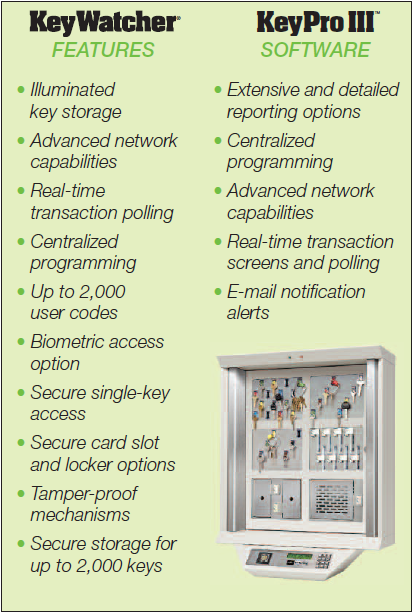 The 96-key unit and one of the 48-key units incorporate card swipe readers to enable employee access using their time-and-attendance cards. All four cabinets have keypads that enable entry using a user’s unique PIN number. Keys may be out for 20 minutes or for up to a full eight-hour shift. Backup keys are also secured in the cabinet. The system can be accessed via IP from anywhere in the building and this online control enables Mr. Brown to administer the system and know from his desktop computer who has any key. He can also generate KeyWatcher activity reports that provide complete information on which keys come and go at what time and on what day. The information provides insight into usage trends that could help the facility support a need for additional equipment. Mr. Brown states that the facility is already looking to install additional KeyWatcher units, and other departments at United have expressed interest in the system for additional uses.